The past few days (weeks) have been hard, to say the least. I’ve experienced a small setback on this weightloss journey of mine. This morning I woke up and looked at my “diet calendar” to see how many stars I accumulated this month. My “diet calendar” is located in my bedroom near my scale. 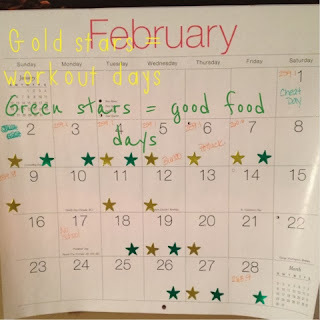 I get gold stars each day I work out, green stars for each day I have eaten well and stayed within my calories. Let’s just say that there are not many green stars this month. Not a lot of gold ones, either. 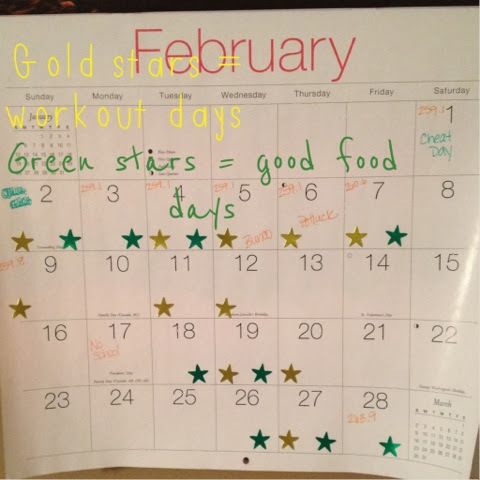 But more gold ones than green, which is good because it means that I’m working out pretty consistently again. Stress is not an excuse to eat like crazy, I know. But lately the amount of stress that I deal with from both my job and my role as single parent has been very overwhelming. But this week, after dealing with a VERY crazy situation at home, I decided that enough was enough. And I did some soul searching. What’s really important in this journey? Is it the weight loss, or the overall health that I’m REALLY searching for? Is it more important to be perfect, or to be focused on my goals no matter what is thrown at me? I can’t be perfect… there’s no way that’s ever going to happen. But as long as I can wake up every morning with a decision to be healthy and happy, I think I’ll eventually get to where I need to be. I’m (once again) stepping away from daily weigh-ins. It’s just too discouraging and I think it drives me insane sometimes. My daily goal will be to stay within my calories (still tracking on MyFitnessPal) and to exercise for at least an hour (cardio + weights) four times per week. I will continue to meal prep, but when I can’t, I will have a back up plan. 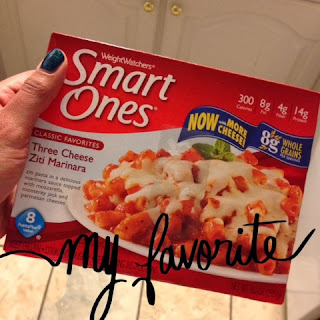 I’ve decided to go back to keeping frozen meals like SmartOnes around for times when I don’t have time to meal prep and need something fast and convenient to eat. This way, I will be able to stay within my calories, and have the satisfaction of knowing I made a good choice. SmartOnes now offer gluten free and vegetarian meals… I’ll definitely be trying those. That’s my immediate plan. And I think it will work. I’ve actually did quite well for the last three days, and I’m looking forward to staying control this weekend. I think giving myself a clean slate will help me get focused and motivated. A setback doesn’t mean you are a failure. The only way to fail is to stop trying. I love your honesty and tenacity. I also track calories, it really helps me focus on the foods instead of mindlessly eating. You inspired me to blog about my journey and I'm grateful for that. Its such a long, challenging road. You've done so great - you'll be back on track in no time. Keep on keepin' on - you are such an inspiration to so many people, even when you are just honest enough to say that things aren't always perfect. Thank you! Sounds like you have a good plan, and that the plan isn´t complicated will make it easier to follow. Good luck you can do this! Hey! I've never commented before, but I've been following your blog for a while now. I think one of the biggest things people struggle with when losing weight is giving themselves some slack. Sometimes you have to realise that it's not realistic to be able to go clean/organic/dairy/gluten/vegan/etc etc all at once. Not with real life happening all the time. Sometimes you have to do what you just did- step back, take a deep breathe and realise what's important for you NOW and focus on that. Maybe in the future when things settle down you can revisit your original plans. Best of luck with the new plan!